Due to the size of most treadmills they aren’t really suited to apartment living. That is unless you’re willing to put one right in the middle of your living room to hog the space. The best small treadmill for apartment owners and occupants lessens the space taken up by these home exercise equipment so you have enough room for all your furniture and also your treadmill. Our small treadmill reviews below are listed with the dimensions of each of the products before each review. This gives you an idea as well as measurements you can match up against your estimated free space. This way you can not only decide better but also anticipate how and where the best position for your treadmill will be. Do You Need a Small (Compact) Treadmill? Before buying a small treadmill for your home, apartment or condo unit, it’s important to figure out whether you need a small treadmill or not. 1. How much free space does your home or apartment have for the treadmill? A small treadmill works well for apartments and small homes because it doesn’t take up a lot of space. This lets you squeeze it into a corner or area without making your home too cramped up. When choosing a compact treadmill it’s also important to measure the dimensions of the free space in your home. Most treadmills are rectangular in shape. This means that you’ll need an area with one long side and a shorter side. 2. What kind of workouts do you plan on doing on the treadmill? In addition to the treadmill fitting into your home’s space, it’s important to consider what your fitness goals are. Most compact treadmills use smaller motors. They also have shorter decks. This makes them less ideal for running. Their smaller motor means you’re not going to be able to run 7 to 10 mph on it. The shorter, narrower surface also makes it harder to take full strides at top speed. So, if you want to be able to do more intense workouts, we recommend going with a bigger treadmill that’s foldable. This lets you fold it up to save space. And, only use up extra space at home when you workout. On the other hand, if you plan on using your treadmill for walking or jogging, then you’ll be able to choose a treadmill with smaller assembled dimensions. Almost all compact treadmills are able to accommodate speeds for walking and jogging. This one fits the strict definition of the term. It has a small footprint when fully assembled. Many of these treadmills are either manual or motorized. The latter units are often equipped with moderate horsepower in order to keep the size and weight manageable. Some compact treadmills are also foldable. This makes them even smaller when not in operation. Some manufacturers also make medium sized treadmills that can fold. This allows you to jog and run on the machine comfortably and keep its size manageable when not in use. Most compact units are light in weight. They also come with wheels. Both these features make them easy to move. Thus, making them ideal for small homes, apartments and even tight basements. You can easily put them into a corner or storage space when not in use and push them out when it’s time to exercise. Like all exercise machines, compact treadmills have their pros and cons. In this section we list out their advantages and disadvantages to help you decide what you need. Space-savers. They don’t need a lot of space. This lets you fit them in small homes, apartments and condo units easily. 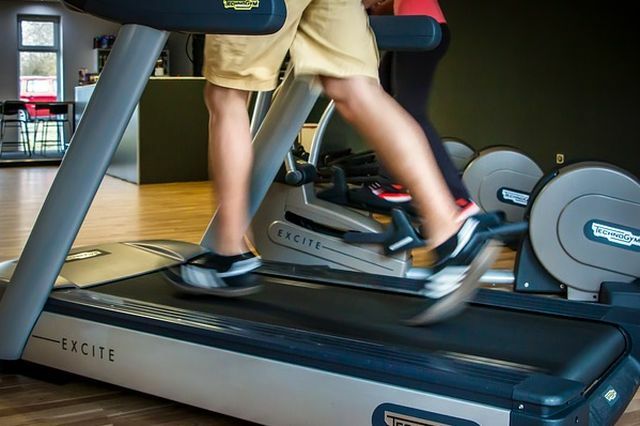 Most small treadmills are around 50 to 55 inches long by 20 to 25 inches wide. Slightly bigger units that are foldable can go up to 60 or so inches long and 30 inches wide. The latter are often foldable to keep their size manageable. Lightweight. Their light weight makes it easy to transport them if you need to move then between rooms or into storages. Foldable. Many can be folded upwards to save even more space when not in use. Folding treadmills are useful because they allow you to get a bigger, higher quality machine that doesn’t take up much space when not in use. This allows you to purchase a treadmill suitable for running and still use it in tight spaces at home or in your basement. Affordable. Small treadmills are much cheaper than bigger units. Unlike bigger units, most small treadmills cost under $500. Many can go as low as $200 to $300 making them budget friendly. Less Power, smaller motor. To keep their size small, compact treadmills are fitted with smaller motors and less electronics. This means you’re not going to be able to do sprints and heavy duty running on them because they often top out at 5 to 7 mph. Shorter, narrower running decks. In order to keep their dimensions short and narrow, the running deck also needs to be reduced. As a result, small treadmills have shorter, narrower decks. This makes it harder to run at full speed with long strides. It also makes them less ideal for taller individuals. Don’t have extra features. Unlike larger, more expensive units, compact treadmills often come with basic features. This makes them much more affordable. But, it also means they don’t include workout programs, high-tech cushioning or mp3 players. Not as stable. Because they need to keep the weight down, the treadmill isn’t as stable as bigger, heavier units. This makes them less suitable for running or intense workouts as the machine can feel a bit wobbly. Compact and lightweight this manual treadmill makes you work harder so that you lose more calories during your cardio workouts. Unlike electric treadmills, you’ll need to power the treadmill’s belt using your legs. It moves if you move. And the faster you go, the faster it goes. Once you stop, it stops too. The device measures 47 inches long and is 19 inches from side to side. This makes it much smaller than most of the regular sized units that include motors. The workout area is 14 inches wide and 39 inches long which offers sufficient space for jogging and walking. As far as running is concerned it fits people who are under 5’10” tall. It isn’t however, built for individuals with long strides or like to have a lot of space width-wise to run on. The device is on a fixed incline of between 10 to 15 degrees, and offers 8 different levels of resistance. The adjustment for the resistance levels can be done on the belt which makes it easier or more harder to make the belt move. Like the Confidence Fitness unit above, this is another good small treadmill for apartments owners. It is about the same size in terms of footprint with the machine above, measuring 46.5 inches long, 21 inches wide and 50 inches tall. They do have a difference when it comes to the running belt’s dimensions though, as this one is 1 inch narrower but 2 inches longer than the one above. With many of their features being similar including their flat folding ability and price, the choice may come down to whether you want a slightly wider workout area or one that’s longer. This does have a 30 lbs. advantage as far as maximum user weight limit is concerned at 250 lbs. Ideally for brisk walking and jogging, you can run a bit on it depending on your stride length and whether you’re comfortable or not in a narrow running surface. As far as size is concerned this is a very compact unit that allows you to fold it flat, standing up vertically. When folded its dimensions are 21 inches wide, 21 inches deep and 50 inches tall. With a similarly sized exercise area of 38.5 inches long by 14 inches wide, this is another small treadmill that fits well in apartments and condominiums. It takes up a footprint of 49 inches by 24 inches making it slightly longer and wider than the other 2 above. It’s one distinction over the 2 units above is that it comes with a built in motor, while the 2 previous are manual. This lets you turn on the machine and walk or jog based on the speed setting of the belt. It does take less effort on your part but also lets you go at a more consistent pace since the machine controls that. The one advantage of motorized treadmills is that you can set the speed to what you plan on doing whether it’s walking on your desk or taking a brisk walk. As far as the controls are concerned, the monitor only displays your current sessions stats including distance, speed, time and calories. There are not high end settings like programs or incline elevation settings involved. This is another folding treadmill with the vertical handlebars folding downwards. This saves more space when you aren’t using it. This is the biggest machine in our best small treadmill for apartment owners, it also offers the most when it comes to features. Its overall size, both when fully assembled as well as folded, is bigger than the others on our list, but still smaller than many mid sized to larger treadmills. The larger footprint does also offer more space on the running deck which is 50 inches by 16 inches. This size gives you more free space to run or jog. In term of value for money, this cardio equipment gives you great bang for your buck. Despite its larger motor and ability to go as high as 10 mph we like that its motor is quiet. It isn’t totally silent, but it won’t make noise that will bother you or your neighbors while you workout. This makes it suit apartment life where you’re separated from your neighbors by just a wall. As far as the feel is concerned, we do like that the running deck’s stability and balance, and that it doesn’t wobble. The cushion system also saves your joints from the heavy pounding of impact forces that running on the pavement may cause. This feature isn’t available in the treadmills we’ve listed above. This is another feature filled treadmill that’s worth a look if you like being able to set programs and have a lot of settings to choose from on the console. It comes with an impressive lifetime warranty that gives you peace of mind that you’ll always have your machine. With a wider body, the TR200 has the widest running surface among our top picks at 17 inches. At 48 inches long the belt also offers more room for your strides. While it does have a bigger working footprint, where it excels is its folding ability. The handles, console and vertical bar all fold down very well allowing it to be super slim when fully folded down. In total, it transforms into an 11 inch high horizontal flat surface fully folded. You can store it lying down under the bed or furniture or standing up. When it comes to training features, this compact treadmill switches between 0.5 mph to as high as 6 mph. The maximum speed makes it more ideal for walking and jogging. You may do light running but that’s about as far as it gets. You can however, increase the incline for more difficulty, as it offers up to 10 incline levels. With a feature filled console that lets you control speed, incline and other features just by pressing a button this is the best folding treadmill for small storage spaces.